Chinese handicrafts are hot items for shopping in Hong Kong. If you would like to take home some Chinese clothing and handicrafts, you must visit one of the Chinese Arts and Crafts shops. 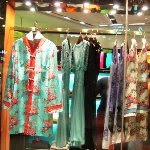 They sell super high class embroidered products, silk fabric, traditional Chinese fashion and handicrafts. They have four shops located at China Resources Building and Pacific Place on Hong Kong side; Star House at Star Ferry and Nathan Hotel on Kowloon side. Shanghai Tang is another luxurious Chinese style fashion house. Everything here has a concept of Chinese culture. Local westerners love this brand name very much. Their shop is situated on Pedder Street in Central, right opposite to The Landmark. They have a branch at One Pacific Place as well. If you want to go economy, you might want to dive into Lee Yuen Street East or West in Central. These two little streets lie between Des Voeux Road Central and Queen’s Road Central, not far away from Central MTR station. There are mini stalls lining up on these two streets selling Chinese stuff. While shopping in Hong Kong, this is one of the places you can demonstrate your bargaining skills.